We are happy to announce we have launched Dota 2 daily fantasy contests. 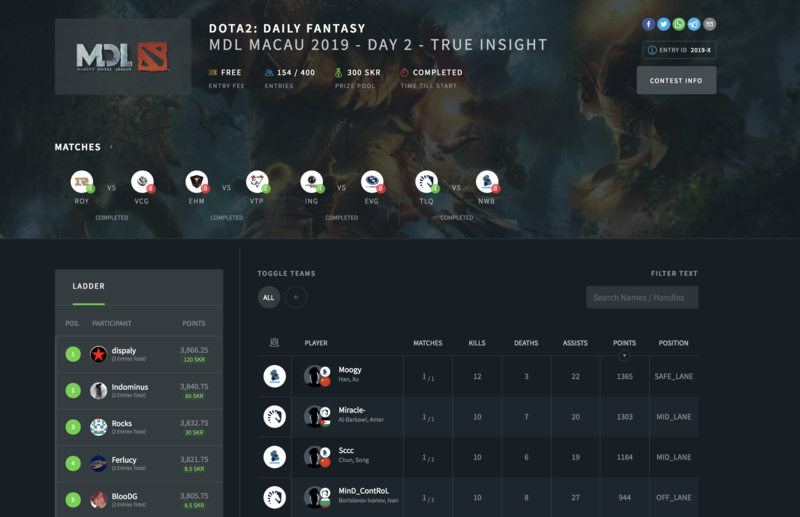 We successfully ran our first Dota2 contest for MDL Macau 2019 last week and congratulations to user "" who topped the ladder. We will be running more Dota2 contests as they become available so keep an eye out for more contests. We will be running a huge competition for The International this year as well now that we have Dota2 daily fantasy. Last week we made a change to where your winnings land from entering free to play contests. We rerouted the Ewallet transactions, as we are planning to run far more pay to play games in the near future. For more information, International users can read more here, and Australian users here.